The Salkantay trek is a great alternative option for Peru travelers to the traditional Inca Trail. 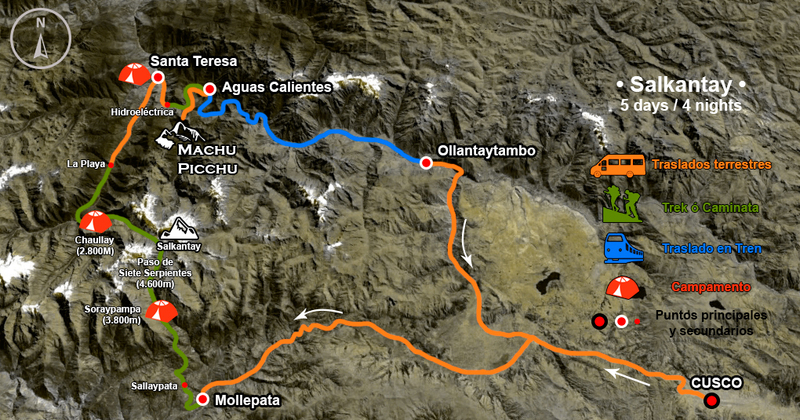 With fewer backpackers than the traditional Inca Trail, this trek is much easier to reserve with less advance notice. The Salkantay trek sees fewer backpackers due to it’s remote and slightly more rugged nature through a magnificent wilderness of the Cordillera Vilcabamba, not seen on the other routes. This trek is slightly more difficult for backpackers than the traditional Inca Trail. The mountains of the Cordillera Vilcabamba form a jagged chain between the Urubamba and the Apurimac rivers, creating a unique landscape to the area. On the north side of the cordillera, massive snow peaks emerge from lush tropical rain forests. 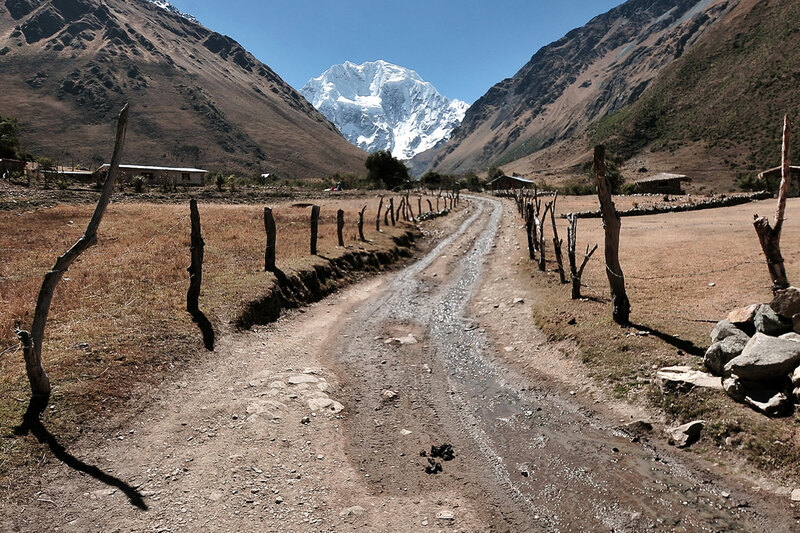 Salkantay, means Savage Mountain in the local language. Visually, this apu lives up to this name, with swirling clouds that rise up from the lowlands of the rainforest, engulfing the 6271 m/20574 ft. peak. 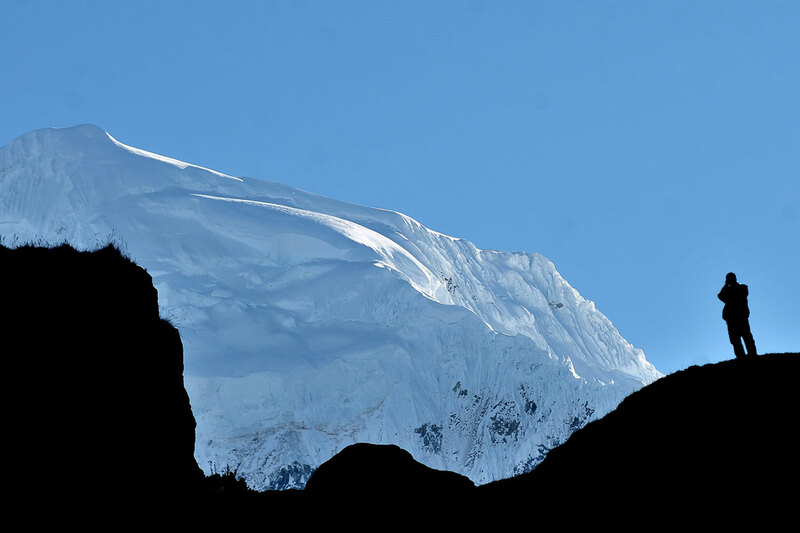 With amazing sights of the Nevado de Salkantay, the tallest peak of the Cordillera., backpackers are sure to return with amazing photos and unbelievable memories. If you are looking for a beautiful trek to Machu Picchu, without the traffic of the traditional Inca Trail, the Salkantay Trek may be just for you and your group for your Peru travel. Our adventure embarks from your hotel around 5:00 AM; we pick you up and travel by local bus or private car to Mollepata (2,800 m/9,186 ft), a small community located along the main road from Cusco to Abancay. We meet our porters (horsemen) and trek crew, who help us with our hike. This morning we hike approximately 3 hours, enjoying the diverse natural beauty along the way, including orchids and hummingbirds. 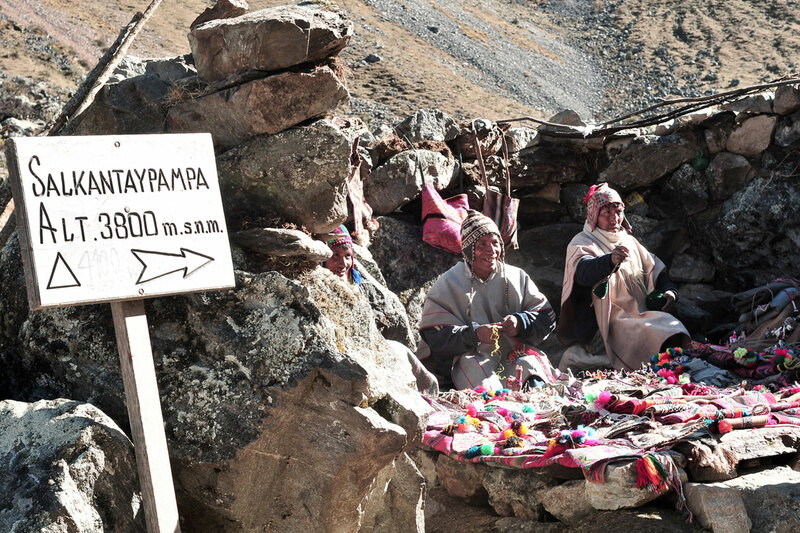 At the tranquil site of Sayllapata, we stop to savor our delicious lunch. After lunch, we have a relaxing 3 hour hike before arriving at our first camp site of Soraypampa (3,800 m/12,467 ft). Settling in for an early night, after a well deserved dinner, we rest and prepare for our most difficult day. Waking very early, we have a good breakfast and depart from Soraypampa. This is a more difficult day; we climb to Seven Snakes Pass (4,600 m/15,000 ft), the highest part of our trek. 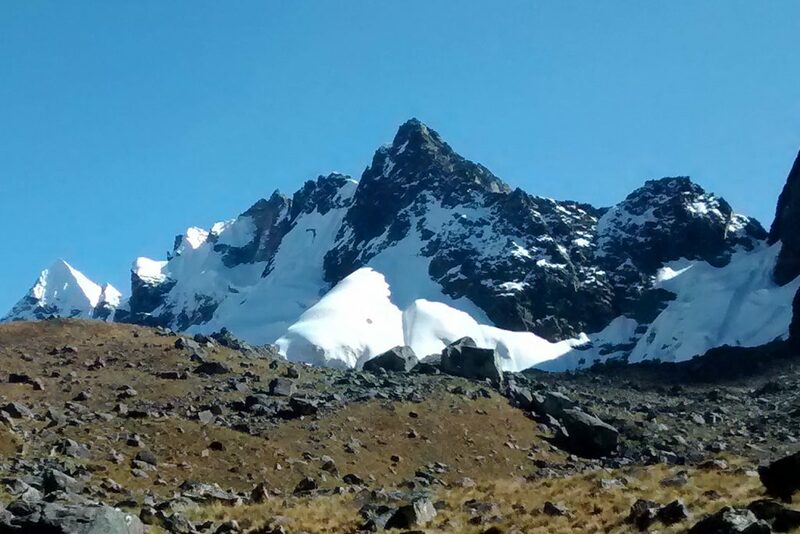 From the pass, we take in a breathtaking view of Salkantay’s stunning snow-capped peak (6,271 m/20,574 ft), the Humantay and Huayanay Mountains, small lakes, moraines, and the flora and fauna of the landscape. We will hike approximately five hours to be rewarded with this view. Afterwards, we hike down, finding streams, hummingbirds and many different kinds of birds. 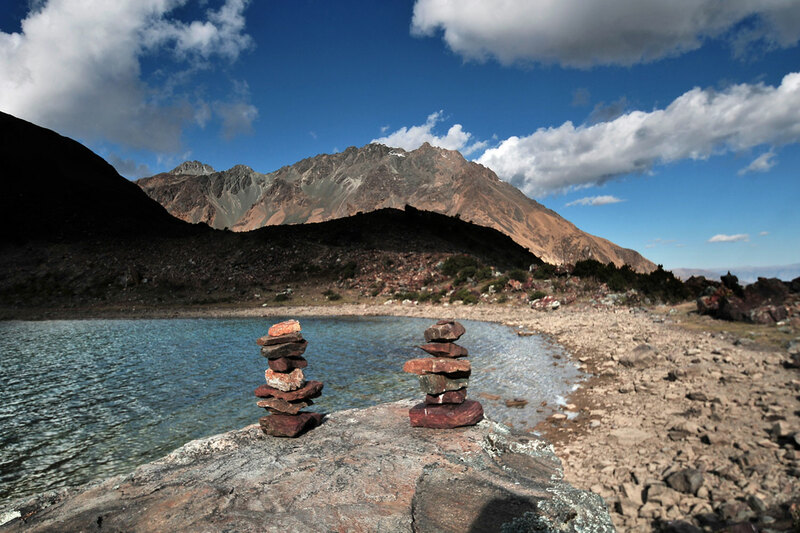 Our hike will bring us to our campsite of Challhuay where we will dine and spend the night. From Challhuay, the climate becomes semitropical as we enter the cloud forest. Breakfast is at 6:00 a.m. so we can be energized for our hike to La Playa for lunch. After lunch we will have an easy downhill hike through the jungle of Ceja de Selva. In this area you will be able to see coca, coffee and several native fruit plantations. Later in the afternoon we have a two-hour bus ride downhill to the village of Santa Teresa. In Santa Teresa, we will have an opportunity to visit the thermal hot springs (additional fee of $8.00 for entrance and transportation), dine and camp. Our journey continues on day four, with breakfast and an hour-long bus ride. After disembarking from the bus, we hike for two hours to the Hydroelectric station and enjoy lunch along the Urubamba River. Afterwards, we continue on our three-hour hike towards the town of Aguas Calientes. From there, we will check into our hostel, dine, and rest up before the next day in Machu Picchu! NOTE: Hikers have the option, for an additional fee, to take a train from the Hydroelectric station to Aguas Calientes. There can be a lengthy wait time as the train leaves only in the late afternoons. This is our final and most exciting day of our adventure! We wake at 5:00 AM for breakfast and prepare for Machu Picchu. Leaving our luggage at the hostel, we take an early bus up to Machu Picchu. 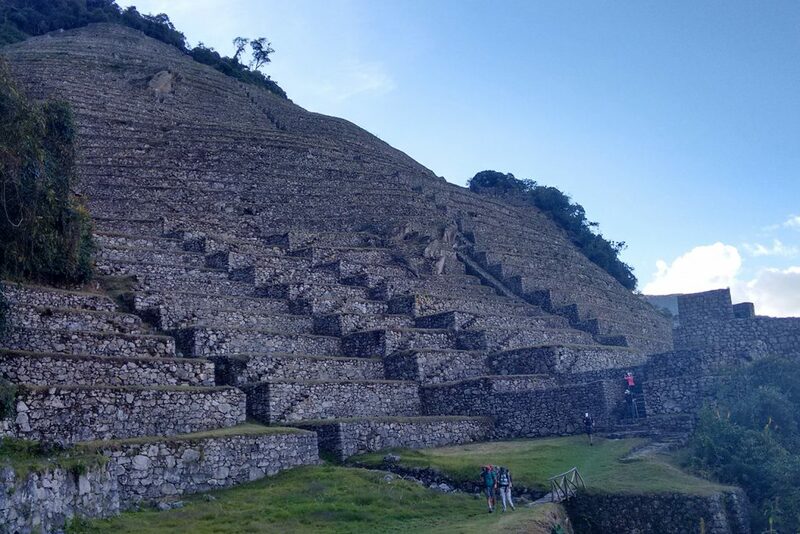 We arrive at the UNESCO World Heritage site of Machu Picchu early in the morning, enjoying the beauty and the magic of this beautiful citadel. A walking tour (approximately 2 hours) is given by your English-speaking guide; afterwards you are free to explore the mysterious city by yourself. If you have made your advance reservation to hike Huayna Picchu (2,720 m/8,923 ft), your guided tour will begin after your hike. It takes 45 minutes on average to reach the top of Huayna Picchu, where you will get a magnificent view over Machu Picchu and its surroundings. We suggest that after visiting Machu Picchu, you take the bus down to Aguas Calientes by 1:00 PM at the latest (assuming our reservation for the train from Aguas Calientes to Cusco departs at 6:45). Buses to Aguas Calientes depart every 10 minutes, but lines for the bus can be lengthy. Check with your guide for your actual train departure time. You can expect to arrive back in Cusco by 10:00 PM, assuming a 6:45 departure time. From there we will provide you a transfer back to your hostel or hotel.